Prime Minister Narendra Modi has said, schemes like Mudra Yojana, Jan Dhan Yojana and Stand Up India are helping in greater financial inclusion. 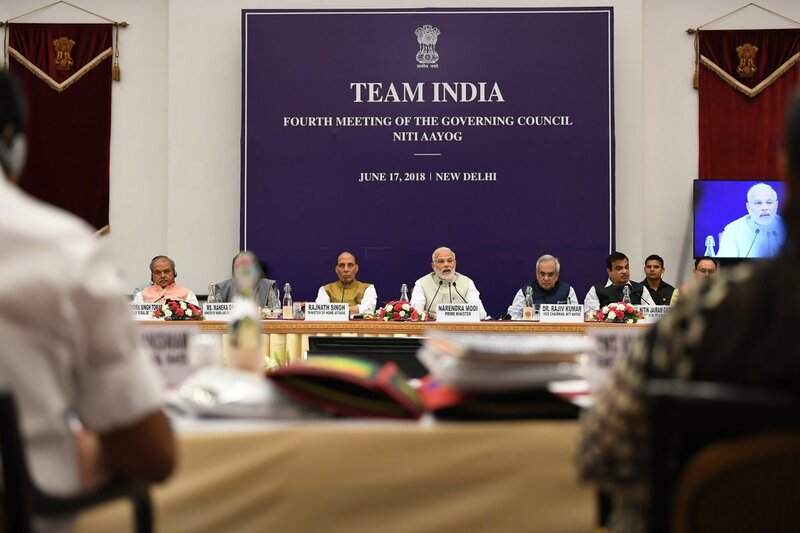 In his opening remarks at fourth meeting of Governing Council of NITI Aayog at Rashtrapati Bhawan today, Mr Modi emphasized on the need of tackling economic imbalances on priority basis. He said, 1.5 lakh Health and Wellness Centres are being constructed under Ayushman Bharat and about 10 crore families will be provided health insurance worth of 5 lakh rupees every year. The Prime Minister said, Indian Economy has grown at a healthy rate of 7.7 percent in the fourth quarter of 2017- 18. He said, the challenge now is to take this growth rate to double digits for which many more important steps have to be taken. Mr Modi said, vision of a New India by 2022, is now a resolve of the people of the country. He said, the agenda of the meeting include doubling of farmers income, development of aspirational districts, Ayushman Bharat, Mission Indradhanush, Nutrition Mission and celebrations of the 150th birth anniversary of Mahatma Gandhi. The Prime Minister assured the Chief Ministers from flood-affected States that the Union Government would provide all assistance to them.